If you ever wondered who or what Pre-Raphaelites were, you had a chance to find out at the Friends’ docent program, “Truth And Beauty: The Pre-Raphaelites And The Old Masters,” co-sponsored by the Legion of Honor, and held at the Main Library, July 16.
as northern Europeans Jan van Eyck and Hans Memling. The principal Pre-Raphaelites were John Everett Millais, William Holman Hunt and Dante Gabriel Rossetti, who was also a well known poet. 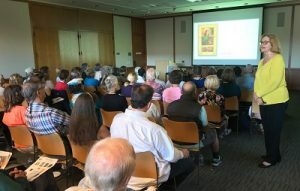 In addition to seeing slides of beautiful paintings, the near capacity audience was treated to a docent who knew how to present an entertaining and very informative program, the Legion of Honor’s Marsha Holm. Her explanations of the symbolism, color, attention to detail and naturalism of the Pre-Raphaelites’ work were eye opening and enlightening. She has presented other programs in the past, and is scheduled for more in the future. The success of the program was indicated by numerous glowing comments made by audience members, as well as a large number of them who signed up to receive the Friends’ newsletter. Click HERE for a reading list related to the lecture.